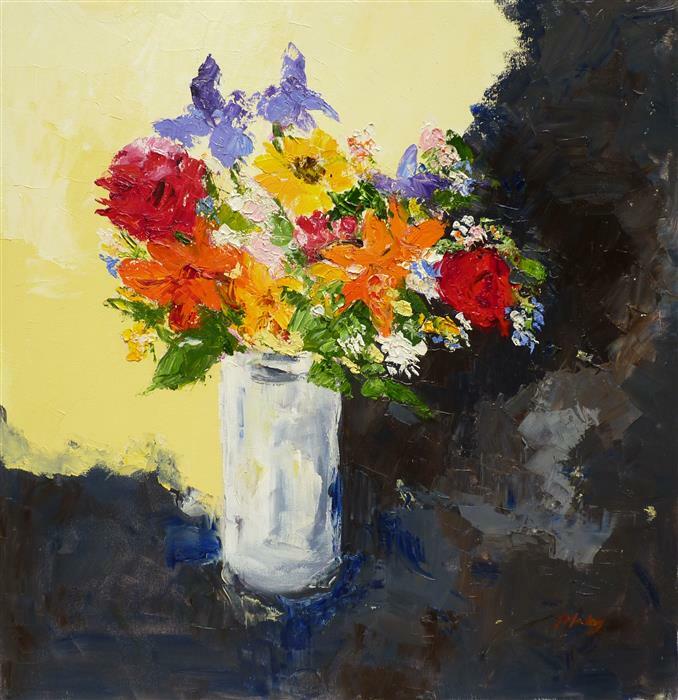 Abstracted flowers in a round blue vase, I wanted to just be free in painting this. The colors just had a psychedelic vibe to it. 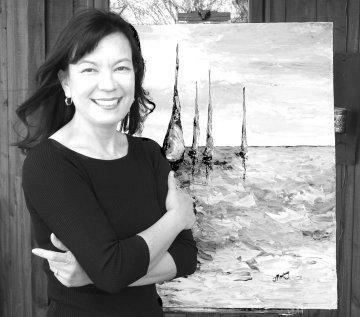 Originally from Japan, Judy Mackey embarked upon her professional artistic career over a decade ago after connecting with a local artist. 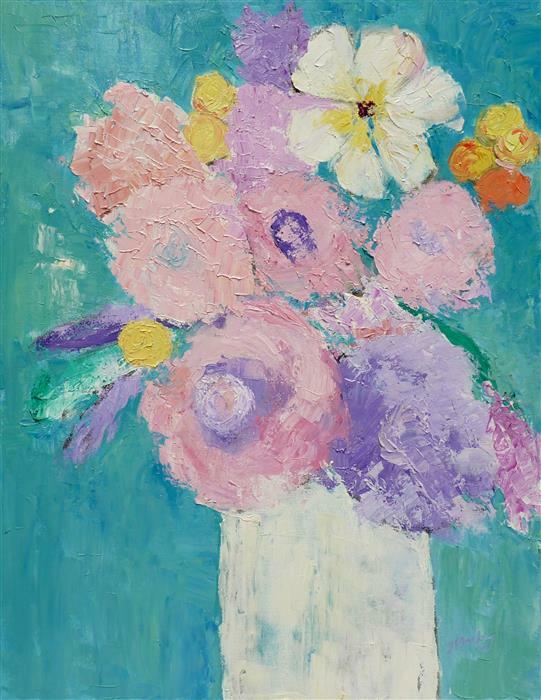 He taught her how to skillfully wield a palette knife instead of a paintbrush, which gave rise to her own stylistic development. Judy uses this technique to create heavy texture. 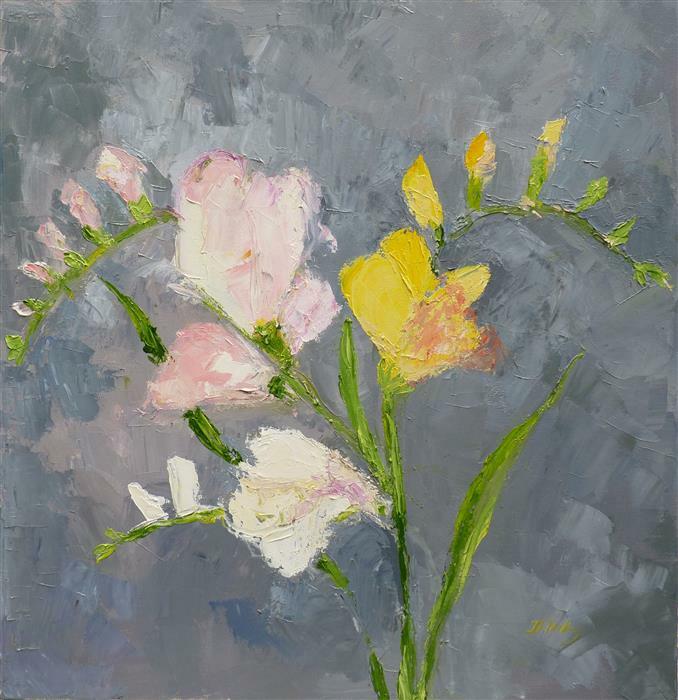 Her medium of choice is oil paint, with which she enjoys mixing and creating new colors with limited pigments. 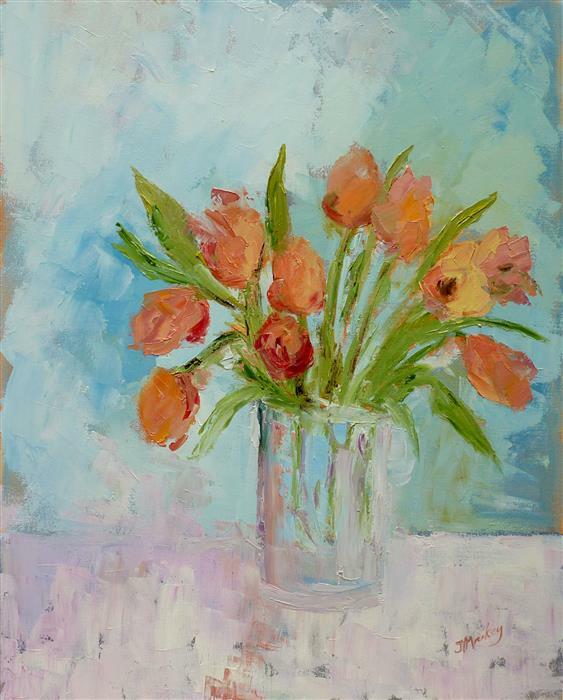 Her work glows with sweet simplicity in a painterly, impressionistic style. Hello everyone! It's NEW ART THURSDAY and I'm happy that my newest painting Cherry has been added to my portfolio. I haven't done trees nor landscapes in a while so I hope you all will like my new addition. Happy Spring! Hello S Kopystko - thank you for liking my painting Melodies. Hi Jenna! I am so pleased you are in love with my painting - it is such a high praise!! By the way, having a "loving" painting of a couple in your bedroom is very good luck the in the love and romance area, according to Feng Shui, if you believe in it ? Thank you so much for posting a comment here - have a fantastic day!! Hi Jenna - so, so, so happy it arrived and that you love it! Thank you for leaving me a comment here. I really appreciate it very much! Thank you!! I just received my painting 'amore' and I love it! The online picture doesn't do it justice. I will be framing it and sending you a photo once I've hung it up. Beautiful work! Thank you Jenna for writing me! I'm so happy the painting will be going to you! If, after you get it, do you think you could take a photo of the wall or table you put it on and share with us? 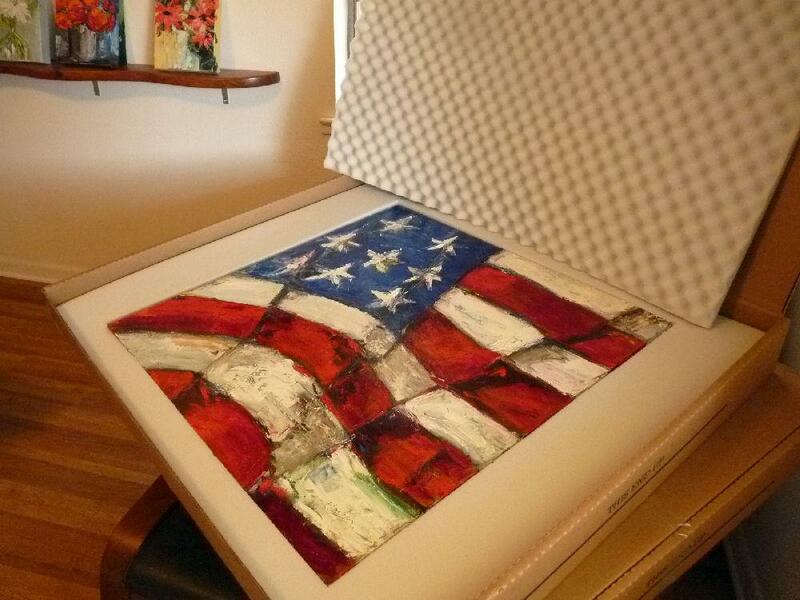 The painting can probably stand on it's own but will also come with a hanger so that it can be hung on a wall. You made my day to put a comment on my wall - thank you! Have a fantastic week! Much amore to you too!! I just purchased 'Amore' and can't wait for it to get to me. I love the mood and the technique you used. Exactly what I wanted!! Happy New Year! 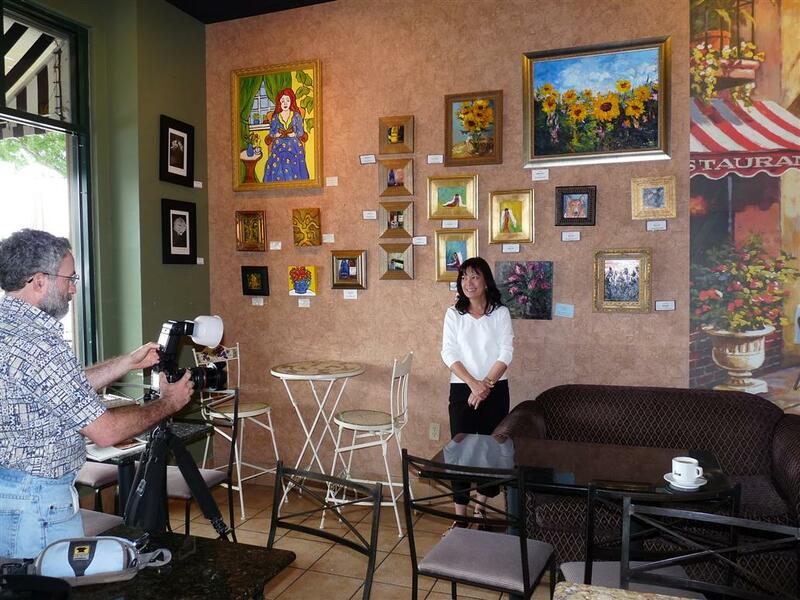 I'm excited to have been listed as Ugallery's TOP 20 Artists of 2013! Happy happy joy joy! I wish all of you a wonderful 2014!! OCTOBER is Breast Cancer Awareness Month. May I recommend my painting "Red Bra" as a thoughtful gift during this month? These past two years, I've donated a walking angel to the Susan G. Komen Walk for the Cure. Have a wonderful day - a wonderful month. Howard - congratulations and thank you for selecting my painting as your gifts to each other - it is so sweet and wonderful and I'm the one feeling so honored :) Happy Anniversary!! Purchased "The Kiss" as our 10th anniversary gift to each other. We are honored to have your talent in our home. I absolutely love this little piece. It is going into my new bathroom to add a bit of color to a mostly beige/brown/white environment. Thanks Judy. I'm blushing and thank you so much for leaving me a comment about Blushes" - So appreciate it! I wanted to paint something in pinks after reading Audrey Hepburn's quote, "I like Pink" - so glad you love my painting. Love your painting "Blushes". Really beautiful and different! Happy New Year to all my friends, family, colleagues and collectors and Ugallery Gallery! Wishing everyone a wonderful, healthy, prosperous and creative 2013! Janet - I checked out Pinterest and saw just how much you've pinned and how it had been re-pinned! Wow! I so appreciate you for doing this and sharing my work. Your note brightened my day :) Thank you. I will sign up for your email list! I just moved several other of your paintings to my boards lovely colors and joy. Thanks! Thank you for tracking me down to my website and here on Ugallery! I am so honored! I'm curious which three paintings you favorited :) Keep me posted and hope you were able to sleep. Have a fantastic day! I had you on my favorites at etsy. You went on vacation and when you returned my favorite pieces were gone. 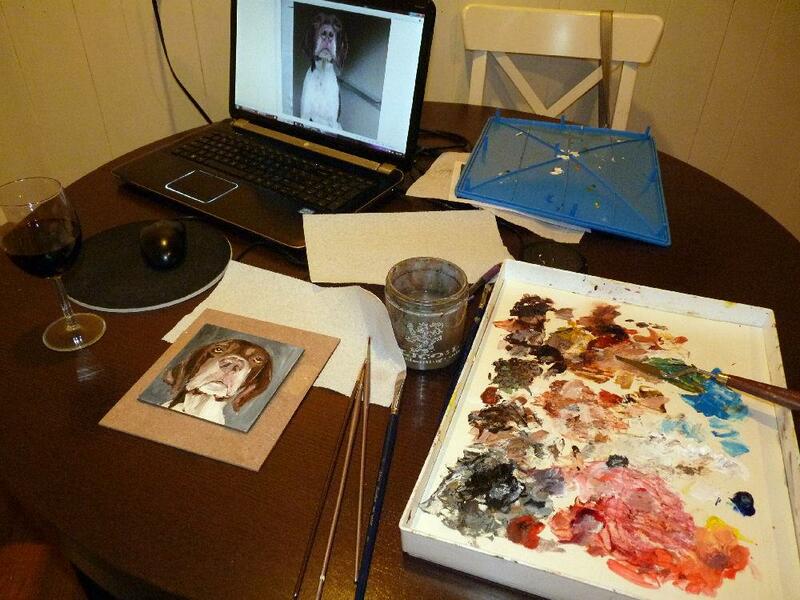 I tracked you down to your own website, still I couldn't find my three favorite impasto paintings you did. Now I'm looking around, plaqued with insomnia and who and what do I find! I'm so excited. I will have to choose which of the three I must purchase, however I think I'll wait until I'm not so groggy! Wonderful to find you! A heartfelt thank you to my collectors and visitors to my page to look at my artwork. Thank you! I'll be posting some new works in the coming weeks. I just added a new painting today "Have You Seen the Wind". It is dark and moody. And yet this past week, two people on separate occassions who'd visited my house/studio seeing this painting up on the wall said the really liked it. Painting, for me is better than therapy, when I'm down, I paint and I feel such a rush of different and better emotions! Love it-Love it! i took it to be framed and the place thought it was Fabulous!!!!!!!!!! I bought you're painting 'very touching' for my husband's birthday. When I surprised him with it he immediately smiled and new exactly what it was about. We had a wonderful honeymoon on the island of St. Lucia, 24 years ago, and that scene could've been a picture of us right off the beach. We had taken a picture of her feet together overlooking the beach, and it was as if you painted us right from the picture. Thank you, finally a meaningful birthday present! We love your style too! I just found your art on Ugallery. I love the hydrangea pieces--they are all sold, can you paint some more of them? Love your art and will post some of it on om Pinterest Board "Affordable Art for the Home." Happy New Year!! Thank you to my collectors who've found me on Ugallery this past year ??? Hello M. Tyler - thank you for noticing! I love painting lovely ladies - the format is small but perfect for hanging in a small space such as a hallway or a bathroom. Within the next few weeks I'll be working on more of these sorts of paintings - stay tuned and come back for a visit to Ugallery! School has started and the leaves will soon be changing colors. I've posted a couple of wine glass paintings - small and intimate enough to hang near a bar area or give as gifts. With Christmas coming I am open to painting a special commission painting - just remember - oils take a bit of time so be sure to contact Ugallery in time for the holidays. 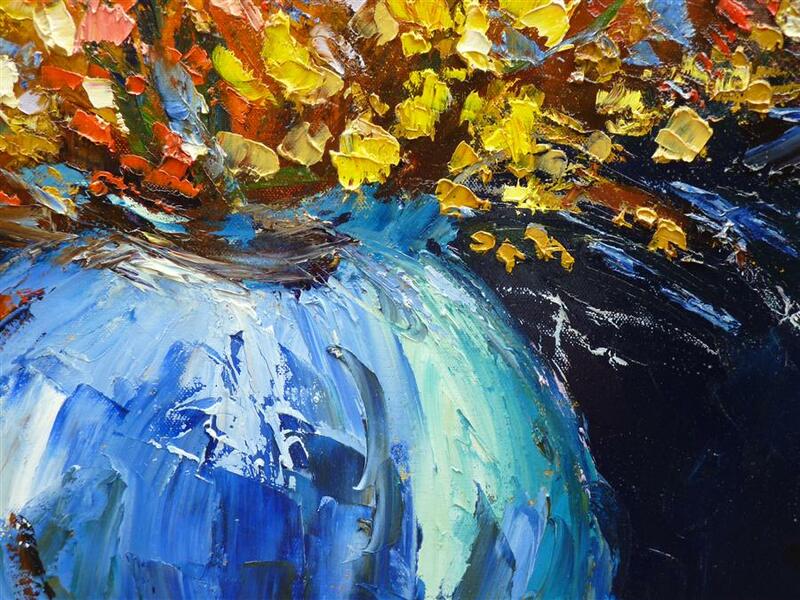 The combination of your palette knife technique and the colors you choose is amazing. I love it! Thank you E. Robin! The colors on the Purple Mist (maybe I'm biased?) are really sweet. Might be hard to see on the computer screen. I so appreicate you leaving me your thoughts :) New works come out on Thursdays - I will have a few more. Also Ugallery has the try for a week policy :) I'm so glad you found me on Ugallery! Purple Mist is absolutely gorgeous! You are so very talented! Hello - I just upload a series of "feet" paintings - sometimes a sense of humor is fun - it's not on the Ugallery just yet - new work comes live on Thursday - I hope you will come back to check on it. Also a new Iris painting which I love how it turned out. 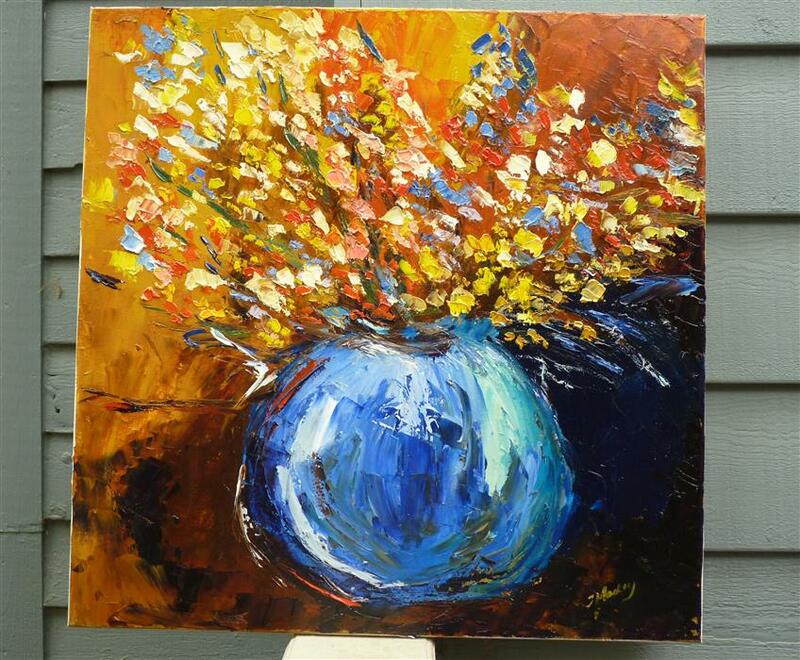 Thank you for clicking and visiting my paintings here on Ugallery! 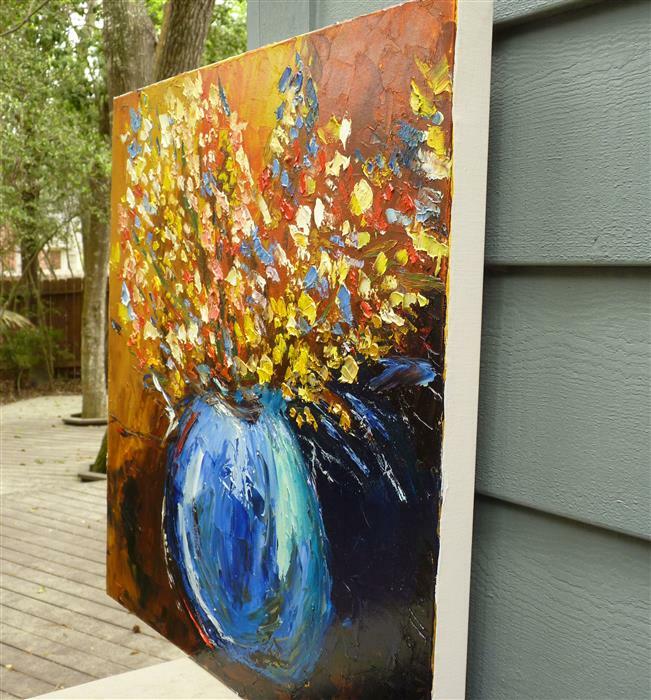 your sunflower painting is absolutely gorgeous, Judy! it's dreamy. i love it. Thank you so much for your comment! You made my day! I've been on Ugallery for a couple of months now and the experience has been very positive - thank you to everyone who clicks on my artwork to take a closer look. Every click means that there is interest and it keeps me going! Thank you so very much.